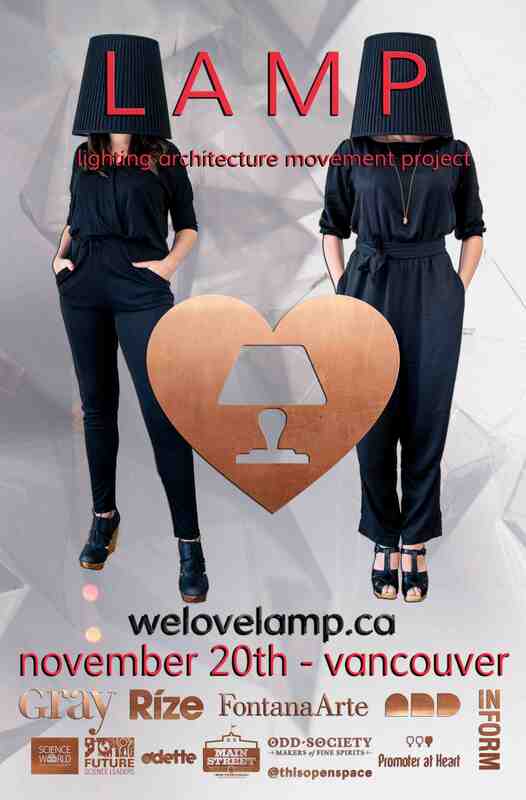 L A M P (Lighting Architecture Movement Project): Thursday, November 20, 2014. We are excited to be part of the judging panel for the 2nd Annual L A M P International Design Competition and Exhibition this Thursday night. Join us for the Opening Celebration Event this Thursday at 188 Kingsway, Vancouver, 6-11pm for beer, wine, beats and stunning design! L A M P is an international design competition created to offer designers an opportunity to engage their talents in unique conceptual explorations and to connect the local community to architecture and design. Expect to see exceptional installations from the lighting industry’s brightest, up-and-coming designers. This year, the top 10 lamps were chosen from over 50 global submissions and entries were critiqued by some of the industry’s most influential design professionals in the Pacific Northwest. The exhibit will feature 10 original jury-selected lighting entries, this year’s LAMP winner, and a one-of-a-kind installation by Ricky Alvarez of Tinto Creative and Leanne Kriz.